This bibliography, like all other bibliographies on this site (including those employing source abbreviations at the ends of gallery entries) will be enlarged as new sources of data are acquired. If you don't see a publication which should be included, please write to me at the address given on the left-hand navigation bar on all the main pages. 101, 122, 170, 171, 211-12, 243, 259, 261, 284, 324; ills. Forbes, Dennis, "Yuya's Mummy Mask Debuts in Cairo," KMT [7:2] 40-45. Hankey, Julie, "Arthur Weigall & The Tomb of Yuya and Thuyu," KMT [9:2] 41-45. Harris and Weeks, X-Raying the Pharaohs (New York, 1973), 142. 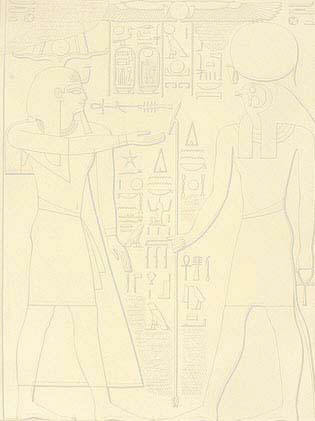 Harris and Wente, An X-Ray Atlas of the Pharaohs (Chicago, 1980) 169f. Maspero, Gaston, Guide to the Cairo Museum (Cairo, 1908), 496. New Light on Ancient Egypt (London, 1908), 243. Quibell, J. E., Egypt Exploration Fund Archeological Report (London, 1904-1905), 25ff. Annales du Service des Antiquites de l’Egypt 7 (Cairo, 1906), 8. 51001-51191 Cairo: IFAO, 1908), pl.s III, V, IX, XI, XVI. Reeves, C. N., Akhenaten: Egypt's False Prophet (Thames and Hudson, 2001), 54-58. The Complete Valley of the Kings (Thames and Hudson, 1996) 174-178. Romer, John, Mitteilungen des Deutschen Archaologischen Instituts Abteilung Kairo #32 (Wiesbaden, 1976), 205. Valley of the Kings (William Morrow and Company, Inc., 1981), 197-204. Sayce, A. H., Reminiscences (London, 1923), 323ff. Schaden, Otto J., The God's Father Ay (Ann Arbor, 1977), 5. Smith, Joseph Lindon, Tombs, Temples and Ancient Art (Norman, 1956), 32ff. Smith, W. S., The Art and Architecture of Ancient Egypt (London, 1981, revised ed. ), 350. Elizabeth Thomas, The Royal Necropoleis of Thebes (Princeton, 1966), 143f. Weigall, Arthur, The Glory of the Pharaohs, (London, 1923), 127-130.